After shooting a man attempting to rob his house, Richard Dane (Michael C. Hall) finds himself at odds with the man's father, Ben (Sam Shepard), newly released from prison. Based on Joe R. Lonsdale's novel of the same name, Cold in July is a gloriously twisting affair, captured here by Joe Mickle in a haze of Texas sunshine and thunderstorms. To try and define the film in narrower generic terms than a 'thriller' feels as if I'm doing the film a disservice. It both feels conventional and yet utterly unique at the same time. Thanks in large part to a narrative which defies prediction, the film is an amalgam of various different elements in references that come together to form a nicely satisfying whole. 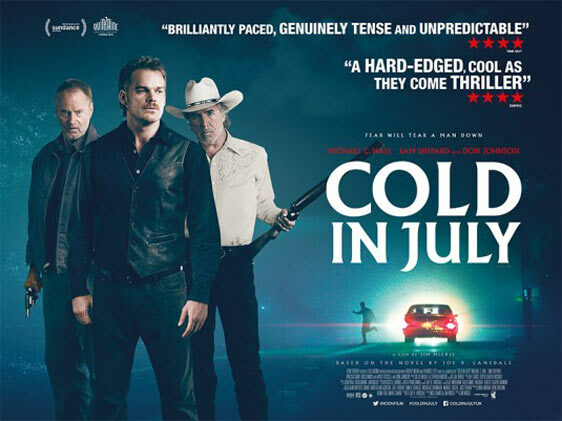 There are a fair few references to be found within Cold in July the most obvious of which are the kind of sweaty 80s thrillers Patrick Swayze tended to star in. The clearest and most consistent homage is the John Carpenter-esque score that underpins the action. Switching from pulsating bass lines to soft, tinkling piano throughout, Jeff Grace's score never quite lets you settle. There's a sense of urgency even in the quieter moments that keeps everything just the wrong side of comfortable. As the plot continues to defy expectations, that discomfort remains as the events get ever darker. Despite expanding in such unpredictable ways, the narrative develops in a wholly organic fashion. An accidental discovery here leads to another revelation further along the way. It also doesn't forget about the characters along the way; each moment impacts upon their developing arcs and affects their future decisions. It's simple stuff really, but it is incredibly refreshing to view a film that is entirely aware that an increasingly dark set of circumstances will see its characters react in very different ways. The performances are particularly excellent with Hall's portrayal of Richard performing a fine balancing act between a guilty wreck in ill-fitting checked shirts and a man determined to correct a mistake. Sam Shepard, as the vengeful father Ben, cuts an imposing figure, but one that is imbued with increasing depths as the film goes on. However, it is Don Johnson in a supporting role who livens up the screen, a man of twisted morality who somehow becomes the compass for the other characters; he doesn't necessarily point them in the legal direction, rather the direction that will bring them some form of emotional closure. As keen as the film is to explore various facets of masculinity, which it does admirably, it does mean that some of the other roles feel a little underwritten. Vinessa Shaw's Ann, Richard's wife, suffers in this respect and it is often unclear what effect she is supposed to be having on Richard's life. In some scenes, she performs an antagonistic function whilst in others, she lapses into a supportive wife. Shaw's performance is solid, but it feels like there are gaps missing with her character and she pretty much gets forgotten about as the film progresses. That niggle aside, Cold in July is a fascinatingly twisting affair, never content to offer the audience a rhythm to settle into or a pattern to predict. If you haven't read the Joe R. Lansdale book on which it is based, I'd advise avoiding any prior knowledge and just let it unfold before you in all its uncomfortable glory.